Are you a known name in your area? Local SEO works to expose your business to your local customers. Currently, Google automatically offers Search Engine Ranking based on a user’s geographic location. It is becoming increasingly important for small business owners to be engaged in a clearly defined set of local keywords and for search engines to know where your business is located. Local SEO allows you to define your marketing regions and efficiently spend your budget to capture more of your target market. Do people know what you offer? Allow your local customers to be able to find you easily. Ignore Local SEO and your business may just fade into the sea. 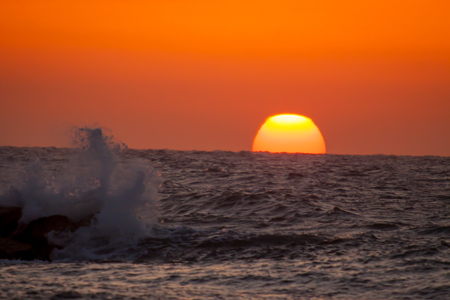 Photo by Jeff Finkelstein, Sun Setting Over Mediterranean Sea. Taking advantage of local SEO is very beneficial for your business. In today’s digital world, the majority of customers search for a business location from their computers at home, or on their mobile phones while they are out and about. Google is taking into account your location through your GPS location on your smart phone, or your IP address from your computer to determine your search results. For example, if you search “Pizza” it is more valuable to see pizza locations that are closer to you than one 30 minutes away. Local SEO helps your business alert customers that you are nearby and encourage their decision to visit in person. In addition, engaging in local listings allows for permanent word-of-mouth through reviews online. Google has integrated their internal systems so Google+, Google Maps, Google Local Listings, and Business Places show up together to provide customer reviews and shows you if any of your friends have made a review. If your business isn’t listed with Google, they’ll pull from other local review sites such as Yelp! and CitySearch. We make sure that your business is listed in the top local directories online. We also make sure that plenty of information about your business is available, as well as optimized for search engines with the proper keywords for a better user experience. It doesn’t stop there though; the more customers that review your business, the more opportunities for new and repeat business, in addition to more value being added to your site. We help to remind people about the opportunity to review your business and work to show off how great your business is. Customers love when you make things easy for them and make the decision-making process simple, especially when it comes to step one: finding out where you are located. Improve the ease of finding your business online for local customers, get more reviews from happy customers, and get more business through word-of-mouth reviews.